Writing as C M Taylor, Craig is the author of Premiership Psycho (Corsair 2011) and the Amazon best-selling Group of Death (Corsair 2012) form two-thirds of a satirical trilogy about contemporary culture described as ‘Brilliant’ by The Sun, and ‘Horribly entertaining’ by The Mirror. 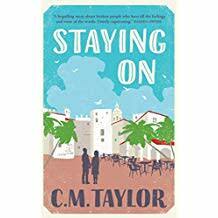 He’s been nominated for the British Science Fiction book of the year, and wrote Staying On, (Duckworth 2018) a geriatric coming-of-age novel set amongst the expats of Spain. Craig edits fiction for a well-known publisher and has ghost-written both fiction and non-fiction. He co-wrote a thriller movie script, Writers Retreat, which was filmed in 2014 and premiered at the Sitges International Film Festival, and he continues to be commissioned to write scripts for TV and film. Craig is an associate lecturer at the Oxford International Centre for Publishing, and has taught widely, often on the underlying structures of narrative, and on Born Digital Literature, a particular enthusiasm that has seen Craig crowdfund a literary app on the Unbound publishing website, as well as instigate an experiment in digital literature with the British Library.